More than a decade after it happened, the last playoff game of Michael Jordan’s career inspired a Jay Z lyric. Psycho: I’m liable to go Michael, take your pick / Jackson, Tyson, Jordan, Game 6, he rapped on his 2011 collaboration with Kanye West, “N—-s in Paris,” a shoutout to Game 6 of the 1998 NBA Finals between the Chicago Bulls and the Utah Jazz. The game lives on in basketball history, and clearly hip-hop verbiage, because Jordan was Jordan, and the way he capped off the night was nothing short of greatness. 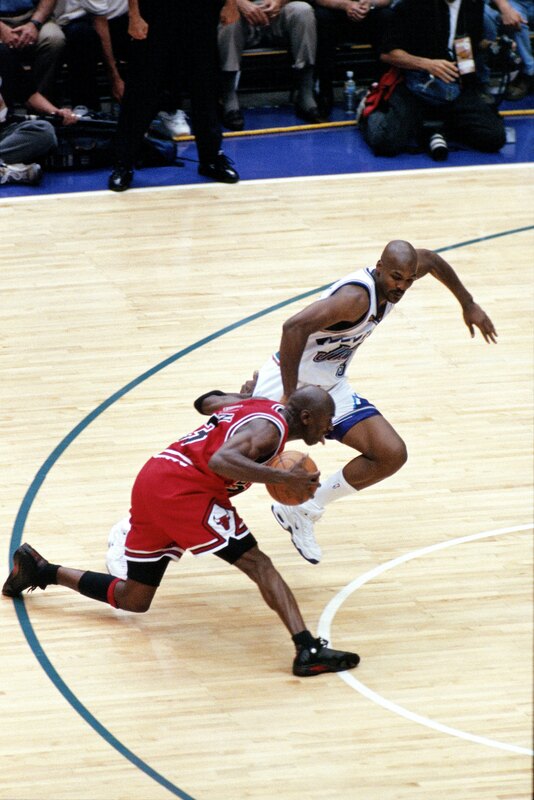 With about 20 seconds left, and Chicago trailing by one, Jordan stripped Karl Malone in the post and pushed the ball up the court with a chance to give his team the lead. The Bulls decided against taking a timeout, giving their leader the free rein to make a play. Jordan gravitated to the left wing and watched the clock tick down to under 10 seconds before making a move. He drove to the middle of the floor, stopped on a dime and crossed back over to his left before pulling up for the 20-footer and hitting nothing but net over Bryon Russell with 5.2 seconds remaining. Michael Jordan of the Chicago Bulls shoots the game-winning jump shot against the Utah Jazz during Game 6 of the 1998 NBA Finals on June 14, 1998, at the Delta Center in Salt Lake City. ”When I got the ball, I looked up and saw 18.5 seconds left, and I felt like we couldn’t call a timeout — it gives the defense an opportunity to set up. It was a do-or-die situation,” Jordan told The New York Times after the game, describing the sequence. “I let the time tick to where I had the court right where I wanted it. 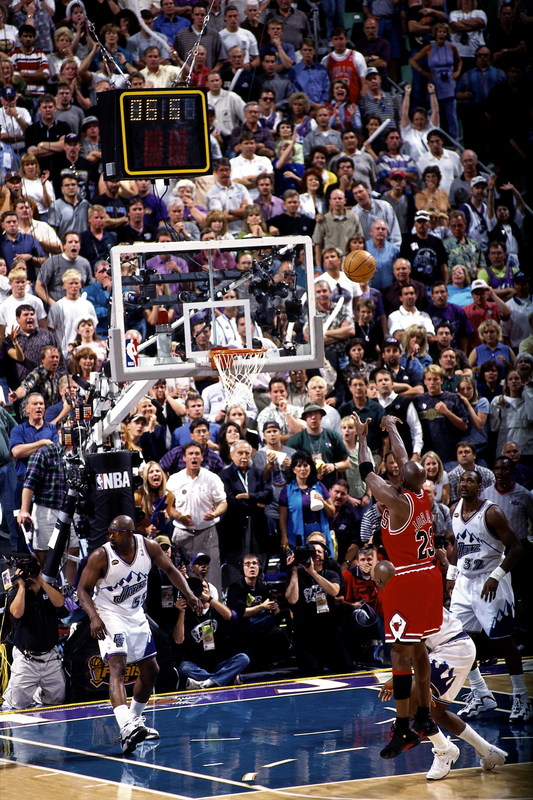 The shot sank the Jazz in Game 6 of the Finals for the second consecutive year by way of a game-winner, after Steve Kerr clinched the 1997 Finals for the Bulls with a 17-foot jumper. Yet, people in Utah are still going crazy off Jordan’s shot for one reason, and one reason only — he pushed off the swarming Russell so he had enough breathing room to get a shot off. Earlier this year, nearly 19 years after Jordan’s heroics, a Utah judge jokingly made a “ruling” on the play. “After much consideration, I am now prepared to rule. He pushed off. And if you think I don’t have the power to decide that, you haven’t read the Utah Constitution,” said Utah Supreme Court Chief Justice Matthew Durrant. Michael Jordan of the Chicago Bulls dribbles past Bryon Russell of the Utah Jazz before hitting the game-winning jump shot during Game 6 of the 1998 NBA Finals played on June 14, 1998, at the Delta Center in Salt Lake City. Did Jordan actually push off? Of course he did. But Russell reached, and you know how the old basketball saying goes? If you reach, I teach. After Jordan captured his sixth championship and sixth Finals MVP award in nine years, there was speculation that Game 6 could be the last game of his career. So, naturally, reporters asked him about his future after the game. And what if the shot to end Game 6 was the end? On Jan. 13, 1999, Jordan retired for the second time in his career, although he returned to the NBA three years later to play two seasons for the Washington Wizards from 2001 to 2003. But never again did Jordan reach the playoffs, making June 14, 1998, a swan song and the final playoff shot of his career a game-winner. How fitting for the greatest of all time.